Hello everyone and welcome back to the new edition of my "Guest Reviewer Of The Day" column. Today's guest is the incredibly prolific blogger/reviewer/philosopher Sherapop. Sherapop has posted more than 1500 perfume reviews online at Fragrantica and the new international fragrance community website, Parfumo. She is a regular contributor to Il Mondo di Odore, and her blog, sherapop's salon de parfum, appears to be the only website in existence dedicated solely to the philosophy of perfume. Every time I don Mahora, I am struck by its tragic fate. 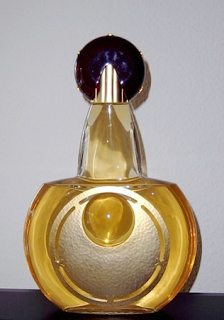 Created by Jean-Paul Guerlain, Mahora appears to have been an attempt to return to the traditional Guerlain style of vrai parfum in the classical sense. Launched in 2000 (although my own bottles give 1999 as the year), a few years after what might be termed the “trivial turn” represented by Champs Elysées in 1996, Mahora was not well received. Indeed, it was a resounding market flop, and perfumistas have been trashing it ever since. Odd, in a way, since perfumistas tend to regard themselves as better informed and possessed of superior taste than “the average consumer,” who serves as the source of marketing data which leads houses to halt production of unpopular perfumes. But rather than decrying the crime committed by corporate accountants in this case, perfumistas in droves have strangely taken up their mantel, insisting that Mahora really was an aesthetic, not just a financial mistake. Sad to say, but Mahora has become a perfume that perfumistas love to hate. Big, voluptuous, and uncompromising, Mahora offers the complexity of the early Guerlain greats in a modern sweet floriental perfume probably intended to draw in both the Champs-Elysées crowd and true believers in Mitsouko, L'Heure Bleue, Shalimar, Jicky, and the rest. Even Samsara, while somewhat blunt and out of synch with all of the Guerlain creations which preceded it, has considerably more complexity than the effete Champs Elysées. I myself was rather taken aback by Guerlain's first fruity-floral fragrance, which upon its launch in 1996 struck me immediately as the Guerlain perfume for people who can't stand Guerlain. Samsara and Champs Elysées survived, while Mahora has been relegated to perfume ignominy by people who may or may not have ever given this creation the benefit of a full wear. And yet Mahora is infinitely more Guerlainesque than either Samsara or Champs Elysées, which speaks volumes of what this house has become. What appears to have happened is that Mahora fell into the neither-nor void: neither the Champs Elysées “now I finally like something from Guerlain!” crowd, nor those appalled by its release were wooed by Mahora. Well, with a few exceptions, among which I of course number. To my nose, Mahora offers the best of classic Guerlain in a rich, 24 karat gold-finished floral which, in spirit, occupies the same general olfactory neighborhood as Hermès 24, Faubourg, another pull-out-all-the stops, no-holds-barred voluptuous floral which I also, no surprise, happen to love. Mahora, however, is far more complex than 24, Faubourg, which altogether lacks any source of discord, an essential facet of Mahora, without which it would be merely a loud younger sibling to Samsara. What went wrong, according to those who delight in slinging derogatory slurs at Mahora, concurring in the received view that the perfume failed because it was a bad perfume, not because it was a marketing flop? Well, first off, this thick, complex, dense elixir comes in only one concentration: parfum. Sure, the spray bottles may claim to contain eau de parfum, but the proof is in the potion: this stuff is very, very potent. My suspicion is that many of the people who claim to revile this perfume overapplied it the very first time they tried and were immediately turned off. Some may even have run for a scrub before Mahora had the chance to work her charms, of which there are many. Mahora is a perfect example of the truism that some perfume really must mingle with the skin in order to develop to its full potential, with all of its layers and undulations and palimpsest complexity. Smelling Mahora on a paper strip would be a blunder, as this perfume must sink into the skin and develop over the course of an hour or so in order to cast its magic spell. Anyone who found the opening too off-putting: too sweet, too animalic, too dark, or any combination of the three, would not have discovered that everything present in Mahora is there for a reason, though this is not easy to see in the opening minutes. And this is the key to an otherwise insoluble conundrum: how Samsara survived, while Mahora did not. Samsara is a clunky, chunky, comfort scent, very well suited to Sundays at home with the family, lounging about in pajamas and eating waffles as they are peeled off the iron. Pass the syrup, pass the butter, pass the down comforters, and stoke the fire burning brightly in the living room: Samsara is here in her element. As loud as the 1980s powerhouses but without the toxicity, Samsara clobbers everyone around not with contention but with love. Love, love, love, hugs and kisses, blankies and warm milk pretty much sum up the emotional content of Samsara. Although it is a tatoo-like perfume, as readily identifiable as Poison, Angel, Eternity, and Obsession, Samsara is totally devoid of the sharpness and aggressivity of those equally iconic perfumes. To hate Samsara would be akin to hating world peace. Breaking out of the cycle of re-births requires that one recognize one's unity with everyone and every thing in existence. In stark contrast, Mahora is just off-putting and uncomfortable enough initially to qualify, ironically enough, as a great niche offering. I strongly suspect that were Mahora launched under the Serge Lutens label today, as a hoity-toity luxury perfume, it would be resounding a success among sophisticated perfumistas. It's much better than Datura Noir and every bit as good as Histoires de Parfums Tubéreuse 3. There, I said it. Yes, there is a discordant, quasi-animalic facet to this perfume which is not going to play well to the Bath & Body Works “Velvet Tuberose is a masterpiece!” crowd, and last of all to those who are seduced to buy perfumes on the basis of a spritz at the counter. As it settles, Mahora becomes a woody floriental with a fairly big dose of tuberose, but also ylang-ylang, and enough frangipani to set the composition apart from the many other tuberose perfumes currently available. Mahora is sweet, but in a profound and enticing way. To my nose, this composition is truly addictive: the more I wear it, the more I want to wear it. In part this is because the longer Mahora remains on the skin, the more it warms up to create a shimmering sillage of oriental and floral and woody elements which are woven together into a silken sheath loosely covering the skin which now breathes through the sheath rather than being suffocated by it. An intense, intoxicating perfume, while entirely distinct from every other perfume in existence, Mahora fits right into the tradition of Guerlain classics, devoid as it is of the plastic and quasi-polymeric elements currently being incorporated in some of that house's new launches, most notably, Insolence. Mahora, like Insolence, has big sillage and excellent longevity, but in this case it is not the result of the latest advances in industrial chemistry. 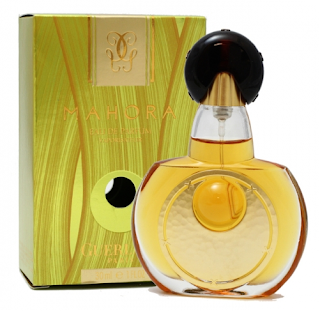 No, Mahora is not a product of organic synthetic chemistry but of the art of perfumery in the classical sense. 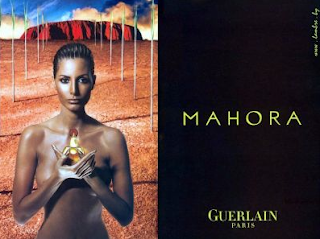 For this reason, and especially in the light of what has ensued chez Guerlain since 2000, Mahora strikes me as the last great Guerlain perfume, launched at the dawn of the twenty-first-century and representing the last vestige of the glorious golden age of perfume now a part of history. Meanwhile, the world of perfumery careers ever more recklessly and frenetically toward banality, with the ceaseless production of meaningless flankers and the proliferation of perfumes not for the sake of perfume but for the sake of profit. Yes, in the twenty-first century, perfumery, too, has entered the age of Twitter. Mahora carved out a distinct niche on the grand olfactory map occupied by no other perfume in existence, but the value of this perfume is not exhausted by its originality. No, Mahora exudes beauty in the grand tradition of the best that Guerlain once offered. It is an irony of no mean magnitude that the best Guerlain launch in recent decades should have met with the tragic fate of discontinuation. Perhaps, in the light of the shameless crimes of reformulation being committed in the name of the IFRA, I should be relieved that Mahora, although in short supply, is the same as she was when she was born. Would I really want to witness the desecration of another great name through the reformulation beyond recognition of what once was a classic perfume? No, better to die with integrity than to be mangled to a mere shadow of one's former self. I bought Mayotte EDP this summer (2011) at Bergdorf Goodman. I love it, and found that I get it at its best if I don't apply too soon after bathing. It needs some skin oil to grab onto. That said, i was told Mayotte was Mahora reissued and renamed. Tuberose/ylang-ylang/frangipani for sure. A heady floral. So, are they one and the same? That's a great question, Julie. I don't really believe any of these renaming, reissue stories. "Guet-Apens is Attrape Coeur," for example. It seems to me that since Guerlain is in the process of reformulating virtually everything, there is no reason to believe that, in the case of these renamed reissues, reformulation is not also taking place. I need to get my hands on some Mayotte, and only then will I be able to test it side-by-side with "vintage" Mahora (what I have). Everyone says that they are the same, but I am skeptical, given Guerlain's general policy on reformulation. It also doesn't make sense from a business perspective. If Mahora was a failure in virtue of her composition, then why would a rebottled, reissued clone succeed? Thanks so much for raising these questions! I probably should have addressed them in the original post. I very much appreciate your thoughtful inquiry!